Written Test: The candidates are a firstly call for the written exam for the Andhra Pradesh Public Service Commission Panchayat Secretary Group 3 recruitment 2018. After that, the successfully passed candidates will be called for the personal interview of the Andhra Pradesh Public Service Commission Panchayat Secretary recruitment 2018. Personal interview: Interview will be taken by the APPSC recruitment authority after the written examination of Panchayat Secretary recruitment 2018. Paper II: Contemporary Problems and Development of Rural Society with Special Reference to Andhra Pradesh. APPSC Group 3 Exam conducted in Two Papers. Paper 1 is for 150 marks. Paper 2 is for 150 marks. Duration of the Paper I is 90 Minutes. Duration of the Paper II is 90 Minutes. The candidates have to report 30 minutes before commencement of qualifying test, to record their biometric impression on biometric system and then only they will be permitted to occupy their allotted seats. The candidates are not allowed to bring any electronic devices such as mobile / cell phones calculators, tablets, IPAD, Blue tooth, pagers, electronic watches pens pencils etc., to the examination hall. Candidates are expected to behave in orderly and disciplinary manner and are prohibited from communicating, consulting or conversing with others causing disturbance and adopting agitation tactics. The candidates should bring their original main hall ticket and I.D Proof and after getting verified they are allowed to the computer lab. Bring two passport size photos, if the photo on hall ticket is not clear. The total Duration of the test is 30 Minutes and the candidates should not leave the examination hall till expiry of the full time. Download Admit Card / Hall Ticket: APPSC Group 03 Hall Ticket is released by Andhra Pradesh Public Service Commission. 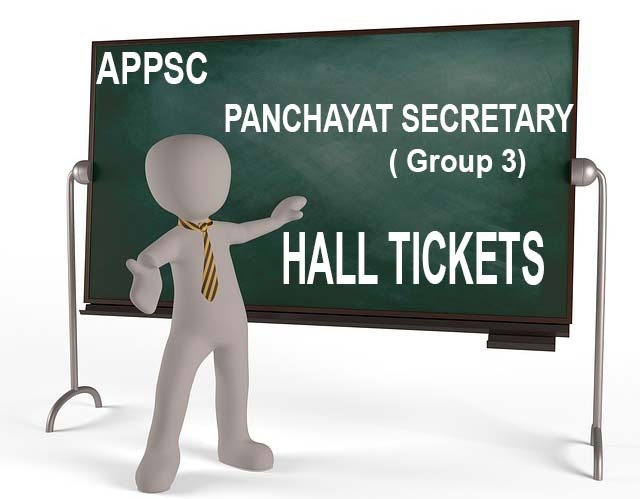 Candidates are advised to download APPSC Group 3 Panchayat Secretary Hall Ticket 2018 on time. Direct link to download for the same is given below. Please i want revaluation results date . ..